THE PROSPECT for America’s carbon footprint looked bleak after Donald Trump withdrew from the Paris Agreement in 2017. A tax on imported solar panels, coupled with the winding down of federal tax credits for both solar and wind, inspired little in the way of hope. Despite the administration’s lack of support, American companies are leading the way when it comes to reducing carbon emissions. One of the ways they are doing this is through power-purchase agreements (PPAs), where they buy clean power straight from independent generators. Data released this week by Bloomberg New Energy Finance show that corporate demand throughout the world, but particularly in America, has boomed. 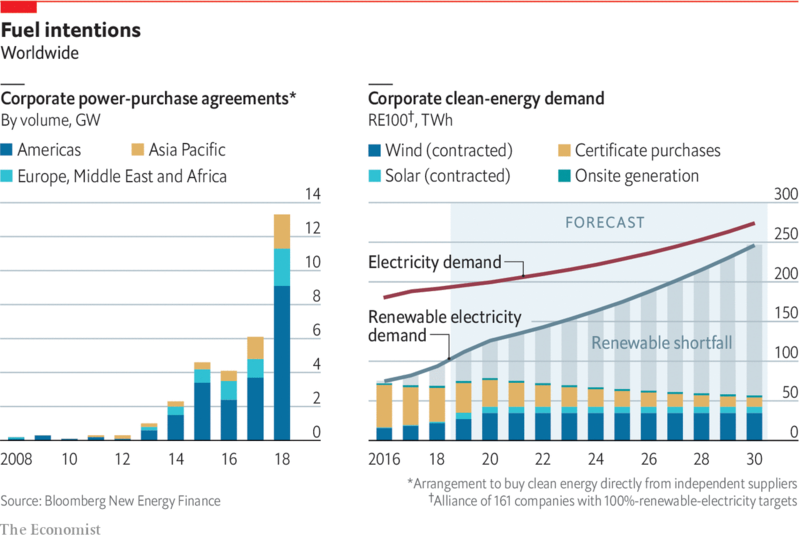 Companies worldwide signed a record 13.4GW worth of clean-energy contracts in 2018, more than double the amount the year before (see first chart). American companies accounted for more than 60% of this total. Tech firms have played a part. Facebook purchased a whopping 2.6GW in 2018, and Google made headlines last year when it matched 100% of its annual electricity consumption with renewable-energy purchases. Firms outside Silicon Valley have also started to dip their toes in the PPA pond. AT&T was the second-largest buyer of clean-energy PPAs last year, and ExxonMobil became the first large oil company to sign one. Companies have started to club together. RE100, an alliance of companies that includes Facebook and Apple, has 161 signatories with 100%-renewable-electricity targets. This is ambitious, though. To meet this target, companies will need to purchase an additional 190TWh of clean energy in 2030 (see second chart). The surge in American activity may merely reflect a scramble to procure clean energy before the tax credits are phased out. There is still some way to go before companies abandon dirty fuels completely.